Before developing my recipe and process for making bagels at my bakery, I toured the famous bagel houses of New York and Montreal, each with their own unique style. This recipe is akin to the NY style with a dense chewy crumb. The keys to getting the bagel right lie in the stiffness of the dough. This is what lends the chewy dense crumb of a great morning bagel. The stiffness is also critical if you’re going to boil them, because it makes them less fragile and prone to deflating while moving into the pot. They may be a bit toothsome, but also yielding, with a subtle sweetness from a dash of sugar or honey in the dough. You can also skip the boil for a simpler process and similar outcome. The crust is a bit softer and a touch sweet from the malted barley in the boiling liquid and It has the totally round shape from not baking on the a sheet tray at first, buoyed by the water. The taste and texture remain largely the same. The finished bagels freeze incredibly well in a heavy freezer bag and the dough keeps well in the fridge for up to 4 days. You better make a double batch if you want extra around though, because these dissappear fast! 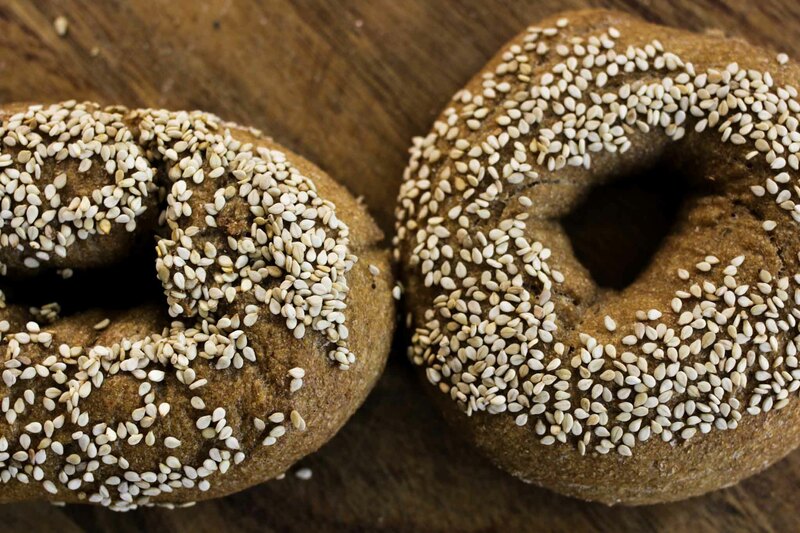 Make about a dozen bagels – Whole Wheat or sifted 20 minutes active time Minimum 2 hours start to finish but works best as an overnight dough. Scale dry ingredients and mix together before adding the water. Warm the water to 90 degrees and mix with the dry. On the left is the boiled bagel and on the right is the baked one. I would say the difference is small but the boiled one does have a slightly softer crust. They are both incredibly delicious and satisfying. Just made this recipe. They came out perfectly chewy and delicious!! Awesome…so glad it worked for you! Ben – Can I shape the dough the night before, so baking in the morning is faster? 1. Chill the dough before shaping and put directly back under refrigeration after shaping. 2. Set your refrigerator to it’s coldest setting (above freezing)35-37 degrees F.
3. Shape them as late in the day/evening as possible and bake as early as possible. A lot will depend on the vitality of your yeast and the exact times and temperatures each stage is occurring at so be prepared to adjust as needed.